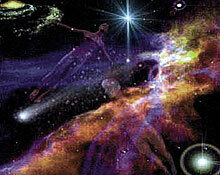 Through conscious astral projection one is able to remember events occurring during an astral journey. On such journeys the conscious mind traveling within the astral body can explore not only various earthly places, but also different realms within other dimensions. The conscious astral projection can be induced through deep meditative states. Some individuals exit their bodies from the solar plexus area, while others leave from the third eye, or simply discover themselves looking down from above at their physical body. The experience of traveling while in this astral state can be accomplished by methods such as a dream-like flight or by visualizing the destination that the individual wishes to visit. During astral projection you remain attached to your physical body by a silver 'umbilical type' cord. You may or may not see the cord. You are aware of things you encounter along the way while out of your body. Relax the body. According to Monroe, 'the ability to relax is the first prerequisite, perhaps even the first step itself' to having an out of body experience (OBE). This includes both physical and mental relaxation. Monroe does not suggest a method of attaining this relaxation, although progressive muscle relaxation, coupled with deep breathing exercises (inhale 1, exhale 2, inhale 3... until about 50 or 100) are known to work well. Enter the state bordering sleep. This is known as the hypnagogic state. Once again, Monroe doesn't recommend any method of doing this. One way is to hold your forearm up, while keeping your upper arm on the bed, or ground. As you start to fall asleep, your arm will fall, and you will awaken again. With practice you can learn to control the hypnagogic state without using your arm. Another method is to concentrate on an object. When other images start to enter your thoughts, you have entered the hypnagogic state. Passively watch these images. This will also help you maintain this state of near-sleep. Monroe calls this Condition A. Deepen this state. Begin to clear your mind. Observe your field of vision through your closed eyelids at the blackness in front of you. After a while you may start to notice light patterns. These are simply neural discharges. They have no specific effect. Ignore them. When they cease, one has entered what Monroe calls Condition B. From here, one must enter an even deeper state of relaxation which Monroe calls Condition C-- a state of such relaxation that you lose all awareness of the body and sensory stimulation. You are almost in a void in which your only source of stimulation will be your own thoughts. Enter a state of Vibration. This is the most important part of the technique, and also the vaguest. Loosen all clothing, remaining covered so you are slightly warmer than what's normally comfortable. Find a quite place where there will be absolutely no noise to disturb you. Now having entered the vibrational state, begin exploring the OBE by releasing a hand or a foot of the 'second body'. Monroe suggests that you extend a limb until it comes in contact with a familiar object, such as a wall near your bed. Then push it through the object. Return the limb by placing it back in to coincide with the physical one, decrease the vibrational rate, and then terminate the experiment. Lie quietly until you have fully returned to normal. This exercise will prepare you for full separation. Another method is the 'Rotation Method' or 'roll-out' technique. When you have achieved the vibrational state, try to roll over as if you were turning over in bed. Do not attempt to roll over physically. Try to twist your body from the top and virtually roll over into your second body right out of your physical self. At this point, you will be out of the body, but next to it. Think of floating upward, and you should find yourself floating above the body. Now visualize a white orb suspended in the air above your head. Mentally focus on the orb and visualize a number '3' on the face of the orb. The numbers can be any color. They may vary with each experience. Visualize the 3 --three times: three number '3's' on the orb. Your body is completely relaxed. You are losing awareness of your physical body. Then repeat the visualization with three number '2's.' You are into greater relaxation. Now visualize the '1's.' You are losing awareness of physical sensations. Your consciousness will be in your astral body. Repeat this using the number '1's' three times. Your consciousness is now in the astral body. This could involve training in several sessions. You may also find audio tapes that take you down into these altered states as well. You will get better and faster with each practice. Now the key is to remain conscious while your body is asleep. Different thoughts may pull you from your focus as the mind loves to chatter. Just push these thoughts away.